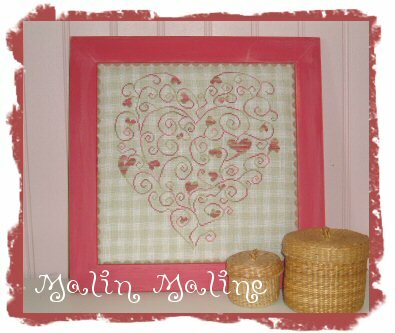 "Tender Heart" is a cross-stitch chart with instructions translated in English. This pattern is a monochrome, you can choose your own colour, the designer has recommended a variegated thread mixing pink and green. According to the designer you will need 12m of thread to complete her design. We suggest you to use the "Christmas" variegated thread by the designer Les Fils à Soso. Even if it was originally designed for Christmas projects, its soft colours will look great with this pattern. See below the "related products" section to buy it. You will need 2 skeins. The model on the picture has been stitched on a 32 count Graziano check fabric (colour "white and green") using two strands of cotton over two threads of fabric. Recommended Fabric: 28 or 32 count evenweave fabric or 14 or 16 count Aida, 40x40 cm (16 x 16 in).